A friend of my then wife to be was married at Worsborough Church on a Saturday in July 1968. Whilst we were outside the church, this YTC decker appeared on the service from Barnsley to Worsborough Park. Although 16 years old by this time the Leyland bodywork still looked in good condition – something I regularly found with Leyland bodywork on Sheffield vehicles. A couple of months later I joined PMT at Stoke on Trent, a fellow BET Group Operator where 1952 deliveries had long disappeared out of the fleet. These are sisters to STD 656-667, my favourite Leyland bodied PD2s. I think most people are agreed on the excellence of post war Leyland bodywork, and indeed the immediate pre war examples as well. Like all good designs, they also had an understated dignity. Wasn’t Worsborough the home of Arthur Scargill? I think he lived at Worsbrough Dale – a different bus route! This rather pleasant countryside between Barnsley & Sheffield was certainly Arthur’s patch, although he mined at Woolley, north of Barnsley. Nice atmospheric picture with the Bus, Herald, Minivan, & Farina BMC saloon- all to be themselves part of an unhappy marriage. There’s a West Riding Police House behind, detached- so Sergeants and upwards for the use of. Typical Tracky bus with multiple dome dents & that cherry paint everywhere except the windows- although here we have that metallic looking maroon that popped up now and again on radiators etc- perhaps wheels- is that right? An old comment about Tracky governor twiddling may explain why they all seemed slow and wheezy- they were like a familiar but well worn jacket. …..but was that a governor on the engine – or the one in the big chair in the office…..? David O, here follows Pete’s "First Rule Of Office Life". When the boss is away from the office – holiday, sick, meeting, or whatever – nobody notices. When the junior is away from the office – holiday, sick, College, whatever – the place falls apart. Joe’s reference to governor must, therefore have been the one in the office! These Tracky PD2’s might be considered sisters to those Sheffield Titans 656-667, David, but would it be fair to perhaps go one step further and say they were estranged sisters?! Agreed they’re nice looking buses, those Leyland bodies were nothing if not elegant, but compared to those Sheffield PD2/10’s, there’s definitely something lacking here. Maybe it was the fact that the Sheffield ones had push-out vents in the front windows of both saloons, or could it have been the chromium wheel nut rings that they usually wore, at least until the latter part of their careers, making them appear just that bit smarter than your average PD2. Granted the Sheffield livery helped too, especially the variation that they were painted in, with the dark blue window surrounds, and when they had the grey roof applied as well, they were absolutely the bee’s knees. Quite ironic really, that such classic machines spent most of their lives shuttling back and forth to Rotherham on the 69, passing miles and miles of smoke belching steelworks! Dave- the thing that people liked – I think- about the Sheffield cream livery was that it was an act of defiance against the tyranny or acceptance of muck! Does anyone remember "there will one day be salmon again in Salmon Pastures!" Are there now? If there are, Joe, it would definitely be a case of "catch and release"! Given the state of the River Don, you certainly wouldn’t catch me eating one! Joe, you’re probably right, and one can admire Sheffield for daring to stand out against the acceptance of grime. But you know the old saying "Where there’s muck, there’s brass!" Sheffield and many other cities have lost an awful lot of the industry that produced the muck, and the jobs that went with it. A colleague of mine used to say the country is just being turned into a giant theme park. That view is certainly supported by the Noddy playbus "liveries" that we have today. I agree, Dave, that "ours" were a cut above the rest – but I always thought that the old STD was a cut above the rest anyway. I hadn’t thought of it as a sister bus to Sheffield’s most elegant 656-667. Two immediate differences – Sheffield’s were on the 7’6" wide PD2/10 chassis (vs the Traction PD2/12 8’0" wide) and the Sheffield buses were the first in the fleet which had the then new smaller slightly more inset headlamps. These differences plus the upper deck front push open ventilators set 656 etc apart from other contemporary Sheffield deliveries. I remember the name Salmon Pastures but I can’t recall now just where it was on the River Don. Salmon Pastures was/is between Norfolk Bridge and Staniforth Road, Ian, that area around there, just before you get into Attercliffe. My auntie lived in T.W. Ward’s office building as a child (my grandparents were caretakers there, and had a live-in flat) just along Savile Street from the Wicker Arches, and she went to school at Salmon Pastures. Here we are in Huddersfield again on the road where all the non Corporation buses had there terminus, although the odd one did sneak in now and then. I think it was Lord Street and the building on the left is the Parish Church, this is where I think all the buses to surrounding towns i.e. Wakefield, Dewsbury and Barnsley for example started there journey. Anyway this is a very interesting bus, I have titled it as a Leyland Titan PD2 as it was listed in my ‘British Bus Fleets’ book but actually it was a re-bodied Leyland Tiger PS2/1. I found in the Roe body list on the ‘Bus Lists on the web’ website that the original Leyland Tiger registration was EVH 211, knowing that VH was an Huddersfield registration I thought I would try to find out who owned it originally. I ruled out the corporation as they were more into AEC single deckers, no way would it be ex Hanson they would have re-bodied it for themselves several times. Then I remembered that Yorkshire Traction were part owners of the Huddersfield based County Motors, so onto the ‘Huddersfield PTG’ website and sure enough there it is EVH 211 fleet no 83 a 1949 Tiger PS2/1 with a Roe B34F body. If you would like to see what it looked like originally there is a link here you will have to scroll half way down the page to find it. Tracky rebuilt and refurbished many PS1 and PS2 Tigers – so much that they merited new registration numbers. They were always referred to as Tigers, not Titans, after their rebuild and re-registration. YTC indeed did rebuild a significant number of obsolete half cab single decks, not all of which were for themselves – for example Stratford Blue had a similar bus to the one shown. The chassis were, more accurately, built using PD2 chassis rails with running gear and other components salvaged from the donor vehicle. YTC had an honourable tradition of rebuilding/re-bodying, as an example look no further than the preserved Tiger number 492 with its’ post-war body. The last vehicles to be rebuilt were the three Leopards in NBC days – Numbers 153/4 and 386. The first two were, in principle the same format as the PS2s i.e. the donor vehicles (ex Yorkshire Woollen in this case) were simply donors of components as the vehicles had updated chassis rails to PSU3E spec. They received Plaxton Supreme bodies with new registrations. Interestingly they had YTC chassis numbers. The 3rd vehicle in the exercise was very heavily rebuilt utilising the original chassis and body frame with updated running gear, it also gained a new registration. I worked for YTC when 153/4 were in for rebuild. The original chassis rails were retained, also no change to the O600 engine and keeping the original 4 speed gearbox made the outcome very predictable. There was no consideration given as to what type of service these buses would be used on. End result, underpowered and lack of top speed. If ever there was a box on wheels then this was it It must be amongst the top three ugliest buses ever So bad were these that YTC adopted a modified livery for them to improve their looks but to no avail. Similar conversion with NCME bodies were very attractive in contrast. David my other personal two are Northern Counties Nottingham style bodies supplied to A1 Lytham and Stratford Blue and the ECW bodies supplied to South Yorks PTE complete with peaks fore and aft. I think Colchester also bought some like the Roe rebuilds how could they sink so low. I think the ECWs were, essentially, a SYPTE "design" improvement which (sorry, here I go again) ruined the balance and symmetry of the original. They also resulted in some atrocious blind spots which were cured by cutting holes in the pillars to provide better vision. Why on earth Colchester then bought them, goodness only knows. Did anyone else? I worked in the body shop at Yorkshire Traction for nearly 50 years from 1956. I had a hand in lifting the old single deck bodies off before the mechanics took over and did a full strip down. 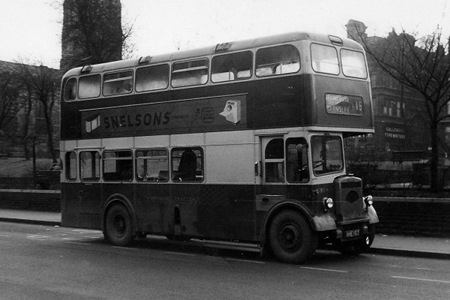 The Leyland PS1s were sent to Charles Roe and were fitted with light weight double deck bodies. They were fine for the first few years , but when the metalastic bearer end brackets became tired they creaked and groaned like an old sailing ship when cornering.The PD2s were sent to Northern Counties and the last batch went to Charles Roe, but were built to a design by Park Royal. They certainly looked a little strange. In later years on having passed my PSV all types driving test I had the pleasure of driving on service most of the Leyland conversions.I think of all the various types of buses I drove at Yorkshire Traction my favourite without doubt was the PD2. To confirm the location, it is Lord Street, Huddersfield where most (all?) the Tracky and County routes terminated. I do not have many photos of rear engined buses they did not have the same charisma has the front engined buses, a little bit boxy for me. Although this Northern Counties body on this bus does look good, mind you I think it was brand new at the time I took the photo. According to the fleet lists I researched the information from for this bus it is classed as a highbridge body but the fleet number ends in an ‘L’ which would suggest lowbridge so why the ‘L’? If you know, let me know, please leave a comment. Photo taken again at the old Bradford bus station, and the bus in the background is an AEC Regent V of Yorkshire Woollen District. The term "lowbridge" or "highbridge" refers to whether or not the bus has a sunken offside or a central gangway on the upper deck, and not to the overall height of the bus. Any bus with a drop-centre rear axle (Lodekka, Fleetline, later Atlanteans etc. can be lower in overall height than one with a conventional straight rear axle and still have a centre gangway upstairs, at the expense of a more complicated floor layout in the lower saloon. Tracky were plagued by lots of low bridges, so they nearly always went for the low height option, and the fleet number code was intended to tell staff where the bus could safely go, rather than the seating layout. That’s a lovely picture of a Tracky bus and shows a service which disappeared some time ago. The 66 service to Sheffield was a marathon and took 2 hours and 44 minutes to get from one end to the other. It was split in the late sixties and after that Sheffield C fleet double-deckers, which also worked the service, were no longer seen in Bradford. Yorkshire Traction took a brief break before returning with joint operation of a revised Huddersfield to Bradford via Cleckheaton service in the early seventies. The PDR1/3 wasn’t something to be proud about as a manufacturer. If I remember rightly there were only somewhere just over eighty built and it was pretty bad. The Fleetline was a much better proposition. 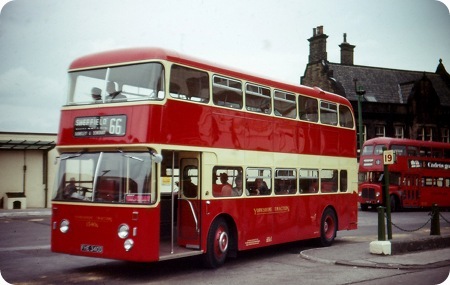 The 66 service, and also the 67 Sheffield – Barnsley -Leeds, disappeared in April 1971 as part of an NBC reorganisation, and Sheffield buses then no longer ran north of Barnsley. Sheffield JOC and "Tracky" were joint operators on both routes, with Yorkshire Woollen on the 66 and West Riding on the 67. Part of the 66 route became "Tracky" service 109 Barnsley – Dewsbury. Strictly speaking, Sheffield JOC disappeared in 1970, with the formation of NBC – which is why Yorkshire Woollen received the C Fleet buses (including PD2/ECW and PDR1/Weymann). Sheffield did continue going north of Barnsley, but on the White Rose Express which eventually faded until the pre-Stagecoach private Yorkshire Traction axed it within the last ten years. Tracky used ex-Lincoln double deck coaches in latter days. Yes, I should have written "and Sheffield Corporation buses (which took over the JOC share of the 65/66/67 after its winding up in 1970) no longer ran north of Barnsley on a local stopping service." Interestingly, I’ve just come across a photograph taken in 1967 of a Sheffield Corporation Atlantean at Bradford working the 66. This was either working off mileage accumulated on Corporation A routes by C fleet buses or maybe the depot had nothing else to send out. David, Service 26 to Bradshaw – that will be Halifax. Halifax Corporation/JOC operated Fleetlines but had no Atlanteans – presumably they wanted to try one. Just a comment regarding the Daimler Fleetline vehicles which were operated by "Tracky" I drove these vehicles during my time at "Tracky" and hated them, the brakes were very poor with absolutely no pedal "Feel", quite often the pedal was "on the floor" and the vehicle was just stopping in it`s own time, very disconcerting I can tell you. The steering was vague, and engine performance left a lot to be desired, this just about summed up the general standard of Daimler vehicles. David, interesting perspective. I would personally agree with you about the Fleetline but it says a lot about the PRD1 Atlantean that people moved away from it in droves towards the Fleetline – especially "Leyland" companies like Tracky. If the YTC Fleetlines suffered from poor engine performance, then somebody in the engineering department must have been tinkering with the Gardner engine speed governors to reduce the output in an attempt to lift the mpg. 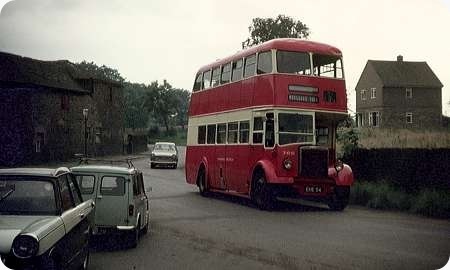 The 1968 batch had 6LXB engines running up to 1850 rpm, but the 6LX motors installed in the earlier Yorkshire Woollen District Fleetlines were certainly not lacking in power if set correctly, even if the modest 1700 rpm governed speed did somewhat limit maximum road performance. Just re-visiting this site and read the comment from David Oldfield and Roger Cox regarding the Daimler Fleetlines, it seems pretty obvious to me that they never drove these horrible buses, one in particular (Fleet No 663) was absolutely dire, right from new it had no power, booked off repeatedly for P**S poor performance, it never got any better, on one journey to Highburton near Huddersfield I had to ask the passengers to get off and wait until I came back down the hill because the horrible thing could not manage the hill with 20 or so passengers on board, after serious complaining the company sorted it, they banned the vehicle from further use on that route. Its amazing how individual drivers have opinions oceans apart on various bus models. For my money, with considerable experience, the Fleetline (Daimler or later Leyland) was the finest of the first generation of rear engined buses – I always loved them, and can’t remember ever driving a really "duff" one. David A, having read your comments on the Fleetline, I must put myself firmly in the camp of David O, and Roger. Before you ask, yes, I have driven Fleetlines a mile or several thousand, and for me they were a far superior vehicle to the PDR1/1 Atlantean. Between 1967 & 1975, I was a driver at NGT Percy Main depot, and we had both Atlanteans and Fleetlines. I left Percy Main in 1975, and I have limited experience of later Atlanteans. If as you say, your Fleetlines wouldn’t pull, then it must have been the way they were set up. The ones we had didn’t have the top speed of an Atlantean, but even with a full load they were more than capable of keeping pace with the traffic, and as for hill climbing, they could literally leave an Atlantean for dead. The standard of maintenance at P/M was extremely high, nevertheless, breakdowns with an Atlantean were not uncommon, and I lost count of the number of times one packed up on me. I contrast, I can count on one hand with fingers to spare, the amount of time I was let down by a Fleetline. Unfortunately, when NBC came into being, and the lunatics had taken control of the asylum, despite the vehement protests of NGT, most of our Fleetlines were transferred to East Yorkshire Motor Services. Yorkshire Tracky PD’s out of Doncaster could, I suggest, tell the same tale as David A’s Fleetlines: they felt sadly underpowered and unlike Doncaster CVD’s, never got a move on: the drivers seemed reluctant to change down- probably because they daren’t drop the revs, so the most modest railway "flyover" hill turned into "can a do it"? What was that about messing with the governors? I found this particular thread this morning. My student days were in Birmingham in the mid to late sixties, so after the comparative trials between the Fleetlines and the Atlanteans. It can’t have been just coincidence that they bought Fleetlines and very little else thereafter. I suspect decisions to buy Fleetlines rather than Atlanteans were much more often influenced by the availability of Gardner (high torque at low speed and fuel frugal) engines! All the Atlanteans and Daimlers were fitted with a Semi Automatic gearbox by Self Changing Gears Co Ltd Coventry, they had nothing to do with Daimler other than supplying the gearbox, British Leyland bought the rights to this gearbox and fitted it to all the later BL buses as standard. A later article in Commercial Motor magazine, describing the problems Nottingham Corporation had with their PDR1/2 Atlanteans, says: "This model, since dropped by Leyland, employed Daimler epicyclic gearboxes in place of the usual SelfChanging Gears epicyclic box, featuring an output drive on the same side as the input drive of the gearbox and thus facilitating the lower axle installation.